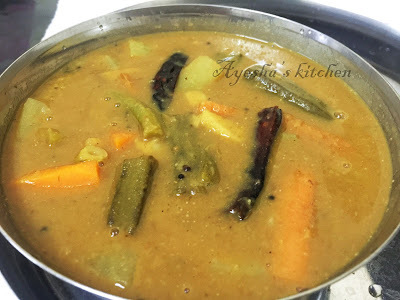 Sambar is known to be the famous dish of South India, mainly Kerala. There are many versions in the preparation of Sambar and is different in different regions. The choice of vegetables is based on personal likes and dislikes but it can be even prepared using a single vegetable. I am here sharing the recipe that tells you how to make tasty sambar without using ready-made sambar powder. Cook chopped onion, moong dal, chopped tomato and turmeric powder along with half a cup water in the cooker until 1 whistle. Meanwhile roast the ingredients given under for roasting with 1 tbsp of oil, until golden. Once cooled grind it with required water to a fine paste. Keep it aside. Now add the chopped vegetables to the cooker along with salt and required water. Let it cook with the lid open. In a pan heat 1 tbsp oil and add coriander powder, chilly powder and fry it for 2 minutes on low flame. Pour it over the vegetables in the cooker and mix well. After that add the tamarind water ( squeeze tamarind soaked in water and take the extract )to it. Cook for few minutes and then pour the roasted paste to it and cook until the vegetables done. Heat oil in a wok and splutter mustard seeds. Fry dried chilly and curry leaves for a while. Now pour the sambar into the wok and mix well for a minute. Switch off the flame.